Doug McKenna on Who owns the news? As of May 27, 2018, I have resigned as the freelance classical music writer for the Daily Camera. The truth is, in today’s journalistic world — certainly in the current environment of print journalism along the Front Range — I was an anachronism. But I genuinely believe that what I had to offer was both rare and treasured, which explains why I did what I did for as long as I did. This should be celebrated. But the pain is real, the sense of loss is real, and it has taken me a few weeks to collect myself enough to write this explanation to readers of the Camera and to classical music organizations in Boulder. It takes the loss of something special to realize how much it meant. Although writing for the Camera was a reasonably small percentage of my total income — generally around 15 percent — it had become the largest part of my public identity and my private fulfillment. Boulder’s classical music culture is unique among cities of its size. And I was blessed for the past seven years to be one of its primary spokespeople and advocates. It was remarkably stable while it lasted. But ultimately, it was offered upon the altar of corporate greed and vulture capitalism. By the time I submitted my last piece around Memorial Day, my writing had become a shadow and shell of its peak around 2014. I don’t mean to compare my case, as a freelancer, to those professional journalists who have lost principal sources of income and actual full-time careers to the ruthless downsizing by Alden Global Capital and its front, Digital First Media. But I do think my perspective is as valuable in its own way as those offered by Dave Krieger, the brave editorial board of the Denver Post, and so many others. In 2011, longtime Camera classical music critic Wes Blomster’s health declined rapidly, and he passed away that October. Clay Evans, who was the features editor at the time, offered me the opportunity to step into the role. I was in a singular position to do so, as I had been helping Wes in some capacity for the previous eight years. There was nobody else in Boulder who understood both the classical music scene in the city and the way the local daily newspaper covered that scene. At the recommendation of professors in the musicology department at CU Boulder — where I had obtained my master’s degree and was working on my Ph.D. — Wes recruited me to help him by writing overnight reviews. This was in 2003, during the first term of the George W. Bush administration. So my connections to the Camera go back 15 years — before Kevin Kaufman’s tenure as editor. I wrote reviews fairly regularly after that, although it was more sporadic after 2006 and I had virtually stopped doing so by 2010. One thing that has been constant since 2003: I always did reviews for the Colorado Music Festival in the summer. For one reason or another, even during the hiatuses, I always did that without missing a single year. This continued through last summer, even after the CMF ended its longtime repeated concerts and even after I had mostly stopped reviewing other organizations. Reviews, especially overnight reviews, were an early victim of budget cuts, even before 2011, which was a large reason for my more sporadic contributions in those preceding years. That remained the case when I became the “full time” classical writer, and most of my efforts were devoted to preview articles — but this was a big job, and entailed more responsibility than I anticipated. I settled into it and mastered the balance of scheduling interviews, meeting deadlines, and fitting things into the calendar. I did tenaciously cling to reviews of opera productions with multiple performances, including rehearsal-based reviews of CU Opera productions. I also reviewed Central City Opera and Opera Colorado, which were the only non-Boulder-based organizations I covered. I inherited this from Wes, and came up with several justifications to keep doing it. All during this time, I was in the final stages of my dissertation work, which I completed in 2012. After finishing my degree, I made a real effort to find work in academia, but this proved just as frustrating and soul-sucking as it was before I had the piece of paper. But I still had the Camera, and many things fell into place. I was able to find a great living situation (renting, obviously) that allowed me and my family to remain in Boulder and for my two older children to remain at their middle and high schools. Clay Evans left in early 2012 to work in marketing and media relations for the Colorado Shakespeare Festival and later for CU Presents. Dave Burdick, who took over for him at the Camera, expanded my role, allowing me to write first-person columns for the first time. The first one of these was related to the completion of my degree. I had a rapport with Dave, as he had been the editor when I left before in 2009. But he didn’t stay long, and in late summer of 2012, Kevin “Moose” Huhn became the features editor at the Camera. Moose left the Camera in early 2016. His replacement, Quentin Young, is a superb journalist and also an excellent editor. Quentin has a real passion for the arts and for the news. I had met him in person in December 2014, when both of us were members of a panel for an event about, ironically enough, the future of print media and the arts. He was covering arts in Longmont at the time, as well as producing the Second Story Garage music videos. We had a connection through Moose, whom we both loved as a supervising editor. In writing this narrative, I have been especially wary of even casting the slightest aspersion upon Quentin. The man is a prince, perhaps even a saint. There have been times in the last two years where he stood up for me when he really didn’t have to put himself on the line. At the beginning of his tenure, things were terrific. He showed intense respect and interest for my writing, and said he would do everything he could to smooth the transition. In many ways, his editorial touch was even lighter than Moose’s was, and his presentation of my work was beautiful. But it was shortly after Quentin took over that things started to go downhill. Since 2011, and in Wes’s time before that, the home for classical music articles was the Life and Arts section on Sundays. We kept classical out of Friday Magazine because it never really seemed to fit there. Moose was particularly dedicated to keeping my material in Life and Arts, even to the point where I was the most regular contributor to that section. But in July of 2016, the Camera was forced to cut the Life and Arts section. As he would later do many times, Quentin went out of his way to accommodate me as my content moved inevitably to Friday Magazine. Sunday had been ideal for my previews because most of the events I covered were on weekends, which provided a natural window between my article and the event. Friday proved far more problematic, as I needed to cover things either more than a week in advance or, in some unavoidable cases, a day before the events. But I adapted. I adapted even though there was less space and less prominence. I made it work. Quentin made it work. I was still getting approval for most of my proposed stories based on precedent and my authority on who deserved or merited coverage. I even started writing overnight reviews for the Boulder Philharmonic again, which I hadn’t done since 2009. Once again, the outlook looked positive. Things changed drastically in 2017. Quentin was given instructions regarding reviews, specifically that we could not run both a preview and a review of the same event. I still fought for the opera reviews as long as I could. I like to think that I had an argument that helped me on several occasions: the Camera was never going to find another me. I think that Quentin knew that then, and that he still knows it now. But the cuts were unrelenting and ever increasing. I will say that Quentin was both explicit and brutally honest about what was going on. And when I resisted, as I always did, he became exasperated. He didn’t want to make the cuts. He knew they were painful. Reviews for CU Opera and Opera Colorado were the first victims. For the first time, the entity known as Alden Global Capital was brought to my attention. Before that point, I had focused so much on content and calendar that the business end of it was something about which I never really had to worry. Things briefly looked up again last summer. I was allowed to do my weekly CMF reviews again, continuing that streak. I reviewed the Central City Opera productions, and the Denver Post (whose features department had been stripped bare) picked them up. In the fall, I managed once again to fit in all of the season previews for the many regular-year orchestral and choral ensembles. But then, in early 2018, the messages became even darker and gloomier than they were before. Quentin was under strict budget constraints as the end of the fiscal year approached. Anything not running in Friday Magazine (such as reviews of any sort) was discouraged. I did manage to do one last review, for Colorado MahlerFest (which, as far as I know, has continuously been reviewed for most of its existence) on May 20. I fulfilled pretty much all of my normal coverage for the spring. But then I submitted what I considered a normal budget for June. I requested a season preview for Central City Opera and a preview for CU’s New Opera Workshop, which have both been regular for years. And I mentioned that the six weekly previews for the CMF — articles that have defined my work for the Camera perhaps more than anything else — would occupy the last two Fridays in June. I mentioned reviews for Central City Opera in July (which have been a cherished part of my summer routine), hoping that their status as long repertory runs (and the fact that the organization closely collaborates with the Boulder Philharmonic and is as close to us as it is to Denver) would help make the case. But Quentin was at the end of an extremely tight budget. On Sunday, May 27, I received an email that not only would the Central City Opera reviews not be done (the Post’s coverage or lack thereof being irrelevant), but he could only fit in one CMF preview and even that would be tight. It was at that point that I lost whatever restraint I had. Before this, reviews, which were always in the crosshairs, had been the principal target of the cuts. A cut to the weekly CMF previews (which are extremely saturated as it is) was the first instance where I perceived being asked to cut something that was really at the core of my coverage. I didn’t handle it well, to say the least. I sent off a series of replies that went through the stages of grief — denial, anger and bargaining for sure. Depression would set in later that week. I indignantly expressed that there was no possible way for me to cover the CMF without the weekly previews (in truth, I could have found a way, at least for the first two weeks). I lashed out at somebody who was only following his own strict instructions. Finally, I offered to cut my pay rate per item in half if I were given the previews, the CMF reviews (which surely would have been cut, ending the streak I had going since 2003) and the CCO reviews. I said that I didn’t think I could continue under such circumstances, and offered ultimatums when I was in absolutely no position to do so. What I am paid is only a part of budgetary considerations. I know that well, and I know about advertising to content ratios. But these had never really been a big issue before. Of course, I again resorted to my credentials, along with a bitter comment about whether arts coverage even mattered at all. I may have rare qualifications, but so do all the other victims of the cuts. The freelancers, the editors, the reporters, the photographers, all of these people have skills that are particularly unique to them. I do continue to believe that the Camera remained devoted to the arts in its community more than other papers of its size. I think that everybody I wrote for and worked with recognized how singular my particular qualifications were. There are times when it’s OK to flash a Ph.D., and I did so, once again. It didn’t matter. However I handled it, I still don’t know how exactly he expected me to respond to that email. Previously, I had begged, but I had never demanded. Acceptance was always difficult. But this was different, and he had to have known that. He did include wording about regretting the cuts, but that he was making them in other places as well. Whatever the case, it became apparent to both of us that this was just not going to work anymore. I was hastening the inevitable with my response. I had already done the interview for the Central City Opera preview, so I felt that I had to write that story, which I did, before hearing back from Quentin. It ran on June 8. I decided to write this lengthy explanation and history as a way to communicate the situation to Camera readers, classical music patrons, and particularly the organizations I cover without having to rehash it many times over or rely on a Facebook post. But I also want to communicate to future potential employers or patrons: I’m listening. Classical music organizations, I might have something you can use. I can read and analyze a score as well as any conductor. I have extensive knowledge of the repertoire across all classical genres. I can obviously write. I want to find some way to continue to serve the community I so dearly love and of which I have been a part for so long. Ideas have been floated. Zachary Carrettin, director of the Boulder Bach Festival, has proposed a Boulder Arts Magazine (with me as editor-in-chief) on a couple of occasions. But that is a long-term proposition and one that would require a lot of backing — and some skills that I don’t possess would have to go behind production and design. A blog is another idea, but one that is less appealing because that market has already been cornered. A podcast is a particularly intriguing idea, one that would allow me to continue doing interviews, including guest artists. I will likely have to return to the slog of trying to find employment in academia — which would entail leaving Boulder — and that is a world that failed me long before journalism did. Boulder has around six orchestras — three of them fully professional — along with spectacular professional and community choral groups. We have an awesome summer music festival at Chautauqua that hosts one of those orchestras. The main regular-season professional orchestra has received national honors and recognition for representing the community in which it plays. We have a state university with a separate College of Music that boasts world-class faculty, including a Grammy-winning string quartet that ranks among the best in the country. The free Faculty Tuesday recitals at CU are a wonder to behold, as are the student opera productions. What other city of our size in the country has all that? 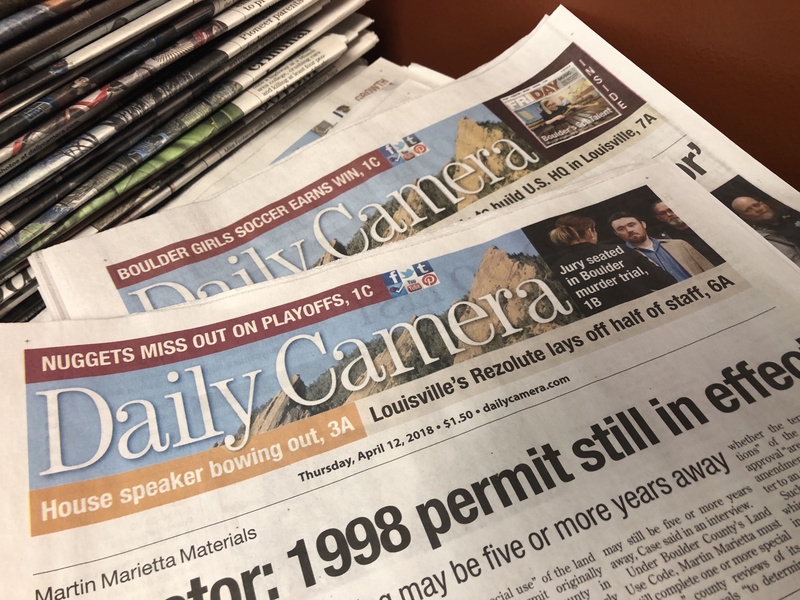 All that deserves adequate coverage in the local daily newspaper, and the Camera, recognizing that, has been remarkably generous with that coverage in the past. And that’s what I’ve been fighting so hard to keep, to preserve. Who knew that the battle would become this quixotic? Now I won’t be able to afford to attend the concerts I’ve covered for years. I can’t justify comp tickets anymore. The whole situation is one of absurdity. Alden Global Capital, You Ruined It. I can’t adequately express my thanks to all who have supported me, especially the readers who told me how much my writing meant to them. You showed that a practicing Mormon from St. George, Utah could thrive in a community like Boulder. I think that I always accurately conveyed what my interview subjects wanted to say, presenting their point of view as it was, even if I disagreed with it. In reviews, if I didn’t like a concept or a performance choice, I didn’t hesitate to say so, even if it was at odds with the public reaction. No matter what, I always felt appreciated by most of the readership and the patrons. I can’t say I fully support Dave Krieger’s idea of a subscriber boycott because of the harm it would cause to some of the most vulnerable cogs in the machine. I mean the carriers, including (as some know) myself. For the time being, I’m still here. And I’d like to stay here and continue to enjoy the arts culture of Boulder, not just classical music, which has become such an integral part of my life and identity. I can only hope that somebody or some organization will find a way to help me make that possible. *Since I drafted and began to revise this narrative, a CMF preview article ran in Friday Magazine on June 22, by features staff writer Christy Fantz. It is superbly written, and Christy obviously did great interviews — but it is apparently intended to cover the entire six-week festival season. The interview subjects were the opening-night soloist, executive director Elizabeth McGuire and Artistic Advisor Peter Oundjian, who does not even appear until the third week. The typical “If You Go” information box described the whole festival, not just one or two weeks. If this is true, it is horrifying. → Who owns the news?